One of the coolest things about analysing text is, it’s everywhere! Irrespective of industry, companies & individuals want to make better informed business decisions based off trackable and measurable insight. With advancements in Text Analysis, companies can now mine text to uncover insights and improve their service or offering to prosper in their market. 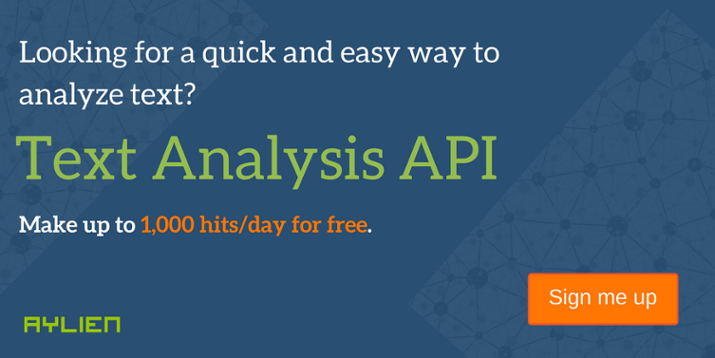 So far at AYLIEN, our Text Analysis API has had great success in the news and media space. But this is just the tip of the Text Analytics iceberg. There are countless numbers of other industries that can gain the same value from such insights. As we don’t have a countless amount of time, let’s stick with a Top 10 list of use cases for Text Analytics. One of the most popular sports to bet on, particularly in Europe, is football (soccer). The top sports traders gather data from the mainstream media and have a deep understanding of the game and it’s politics at a local level. If you live in England and you bet on English football, irrespective of the division, it’s relatively easy to understand your market. You can successfully bet on a local second division English team because you speak the language, read the local newspapers and may even follow some of the team members on Twitter. But what if you’d like to do the same for a similar team in Spain and you don’t speak a word of Spanish? A Text Analysis API capable of understanding Spanish would allow you to extract meaning from local Twitter feeds, giving you insights into what the local fans are saying about their team. These people understand the squad dynamics at a local level. If, for example, the star striker of Real Club Deportivo Mallorca has an argument with his wife the night before his cup game, is he as likely to be the top scorer on match day? As with sports trading, having an insight into what is happening at a local level can be very valuable to a financial trader. Domain-specific sentiment analysis/classification can add real value here. The same way in which fans have their own distinct vocab based on the sport, so too do traders in particular markets. Intent recognition and Spoken Language Understanding services for detecting user intents (e.g. “buy”, “sell”, etc) from short utterances can help to guide traders in deciding what to trade, how much and how quickly. VOC applications are primarily used by companies to determine what a customer is saying about a product or service. Sources of such data include emails, surveys, call center logs and social media streams like blogs, tweets, forum posts, newsfeeds, and so on. For example, a telecom company could use voice of customer text analysis to scan Twitter for customer gripes about their broadband internet services. This would would give them an early warning when customers were annoyed with the performance of the service and allow them to intercept the issue before it involved the customer calling to officially complain or request contract cancellation. Whether it’s workers claiming false compensation or a motorist disclosing a false home address, fraudulent activity can be discovered much more quickly when those investigating can join the dots together, faster. In the latter case, for example, the guilty party may give an address that has many claims associated with it or the driven vehicle may have been involved in other claims. Having the ability to capture this information saves the insurer time and gives them greater insight into the case. In this use case, companies examine the text that comes from warranty claims, dealer technician lines, report orders, customer relations text, and other potential information using text analytics to extract certain entities or concepts (like the engine or a certain part). They can then analyze this information, looking at how the entities cluster and to see if the clusters are increasing in size and whether they are a cause for concern, for example. In this use case, companies can use text analytics to route requests to customer service representatives. For example, say you’ve sent an email to a company while on hold to one of their reps. You might have a question or a complaint about one of their products. The company can use text analytics for intelligent routing of that email to the appropriate person at the company. This could also be possible in a call center situation, provided you have sufficiently accurate speech-to-text software. As was the case with the VOC application, taking timely action on a piece of Social Media information can be used to both retain and gain new customers. For example, if a person tweets that they are interested in a certain product or service, text analytics can discover this & feed this info to a sales rep who can then pursue this prospect and convert them into a customer. TV shows or live televised events are some of the most talked-about topics on Twitter. Marketers and TV producers can both benefit from using Text Analytics in two distinct ways. If producers can get an understanding of how their audience ‘feels’ about certain characters, settings, storylines, featured music etc they can make adjustments in a bid to appease their viewers and therefore increase the audience size and viewers ratings. Marketers can dig in to social media streams to analyse the effectiveness of product placement and commercials aired during the breaks. For example, the TV character ‘Cersei’ from Game of Thrones is becoming a fashion icon amongst fans, who regularly Tweet about her latest frock. High street retailers that want to take advantage of this trend could release a line of ‘Queen of Westeros’ style clothing and align their commercials with shows like Game of Thrones. Text Analytics could also be used by TV Executives looking to sell to advertisers. For example, a TV company could mine viewers tweets & forum activity to profile their audience more accurately. So instead of merely pitching the size of their audience to advertisers, they could wow them by identifying their gender, location, age etc and their feelings towards certain products. Text Analysis could be used in both the search and selection phases of recruitment. The most basic application would be identifying the skills of a potential hire. In the recruitment industry, the real value comes from identifying prospects before they become active on the job market. For example, it would be very powerful to know if somebody tweets about disliking their job or expresses an interest in working in a different field, larger/smaller company, different location etc. Once you have identified such a prospect, you could use Text Analytics to analyse the suitability of this person based on what others say about them. Mining news and blog articles, forum postings and other sources could help to evaluate potential hires. Companies like Expedia have millions of reviews on their website, from travellers all over the world. Given the nature of the site and the fact that their users are looking for a stress free experience, having to sift through hundreds of reviews to find a place to stay can be a real turn off. Text Analysis can be used here to build tools that can summarize multiple properties in 2-3 word phrases. Instead of scrolling through a list of hotel features like heated pool, massage therapy, buffet breakfast etc, you could simply say “Luxurious Hotel and Spa”. Did you like our top 10 use cases? If you work in an industry that’s not mentioned above and have an idea of how Text Analytics could help you, please let us know! Subscribe to our blog and keep an eye out for our next post on how Text Analytics can add value to your business.